DeVos Spars With Teachers, Trump On Autism And More Education Stories Of The Week : NPR Ed With Secretary Betsy DeVos rolling up her sleeves and joining President Donald Trump to talk with educators and parents, Washington, D.C., is at the center of a lot of education news this week. 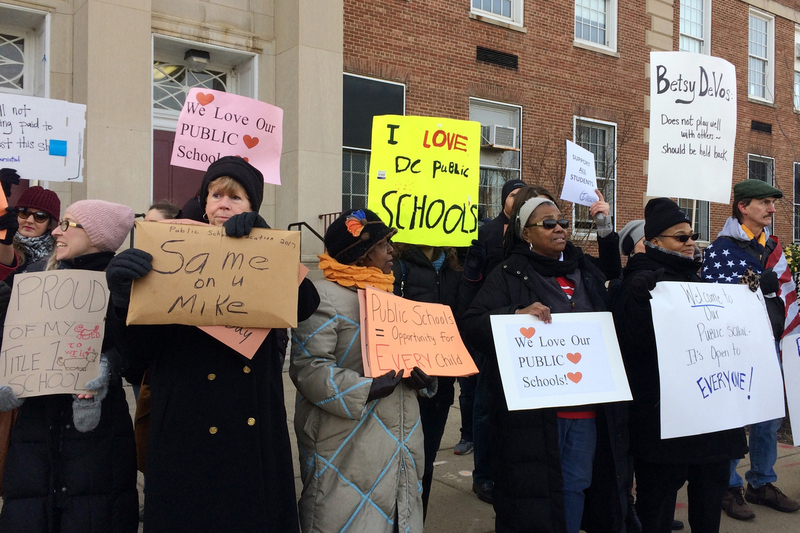 Protesters gather outside Jefferson Middle School in Washington, where Education Secretary Betsy DeVos paid her first visit as education secretary. With Secretary Betsy DeVos rolling up her sleeves at the Education Department and, at one point this week, joining Donald Trump at the White House to talk with educators and parents, Washington, D.C., is making a lot of education news these days. For those of you struggling to keep up, the NPR Ed Team is trying something new: a weekly recap of the latest national education news. Editor's Note: This story was updated Saturday afternoon to reflect DeVos' interview with Townhall and the subsequent response by Jefferson Academy in Washington, D.C.
At DeVos' first major public appearance after her controversial confirmation, protesters temporarily blocked her from entering Jefferson Middle School Academy in D.C.
One protester who was arrested and later released is an Afghan refugee who wrote this personal history for NPR last month. In an interview with the conservative Townhall on Thursday, DeVos briefly mentioned her visit to Jefferson Academy, describing the teachers she met as "wonderful, genuine, sincere." But she was also critical, suggesting that the Jefferson teachers were "waiting to be told what they have to do, and that's not going to bring success to an individual child. You have to have teachers who are empowered to facilitate great teaching." What followed was an epic Friday night tweetstorm, as reported by Emma Brown of The Washington Post. As Brown notes, Jefferson is one of the fastest-improving schools in the city and five years into a turnaround. "The protesters' behavior is a reflection of the way some seek to treat our education system – by keeping kids in and new thinking out," DeVos said. "Friday's incident demonstrates just how hostile some people are to change and to new ideas. Without realizing it, we, too, can fall victim to this trap of seeing our work in education as an "us vs. them" approach." The Education Secretary went on to praise magnet schools, a form of non-charter public school choice, for their role in combating segregation. Trump On Autism Rates: "Horrible"
The day before DeVos' speech, she appeared at the White House alongside her new boss, President Trump, for a listening session with parents and educators. Trump spoke in favor of school choice when "properly done" and declared that "millions of poor, disadvantaged students are trapped in failing schools." "That's why," Trump said, "I want every single disadvantaged child in America, no matter what their background or where they live, to have a choice about where they go to school." The guests included representatives from the public, charter, private, and home-schooling world. At one point, Trump also referred to "tremendous increases" in the rate of autism. This is a matter of some scientific controversy, but U.S. public health experts believe that what's happening is largely an increase in diagnosis and awareness, not necessarily in the number of children with the condition. The idea that autism itself is on the rise is a talking point for the anti-vaccine movement. Trump has met with Robert F. Kennedy Jr., who propounds, against all scientific evidence and mainstream medical opinion, that childhood vaccines cause autism. 23-year-old Daniel Ramirez Medina is suing for his release after he was detained by immigration authorities in Seattle on February 10. He came to the United States from Mexico as a child and had obtained a work permit under Obama's Deferred Action for Childhood Arrivals, or DACA program, which covers hundreds of thousands of young people, primarily students. Lawyers and advocates believe that this is the first case of a DACA recipient being arrested and held. Many DACA permit holders have been on edge since President Trump's inauguration, after Trump vowed to end the program on the campaign trail this fall. However, Trump's stance seems to have softened even in the last few days — in a news conference Thursday, Trump said that most DACA recipients are "absolutely incredible kids." Approximately 17,000 international student visa holders were affected by President Trump's executive order banning entry to the U.S. from seven majority-Muslim countries. Now, the Ivies, along with other elite institutions, have filed an amicus brief in support of Darweesh v. Trump, one case challenging the ban. Each school "has a global mission," the brief argues, "and each derives immeasurable benefit from the contributions of diverse students, faculty, and scholars from around the world. Because amici seek to educate future leaders from nearly every continent, attract the world's best scholars, faculty, and students, and work across international borders, they rely on the ability to welcome international students, faculty, and scholars into their communities. The Executive Order at issue in this case threatens that ability, and creates significant hardship for amici's valued international students, faculty, and scholars." Idea.ed.gov, a vital resource for parents of students with disabilities, went offline on Feb. 8, just one day after DeVos' contentious confirmation. It was unfortunate timing not just for concerned parents but for DeVos, too. She misstepped badly during her confirmation hearing when she suggested to senators that states were not necessarily bound to follow the federal Individuals With Disabilities Education Act. That 1975 law requires schools to give students with disabilities "a free appropriate public education." As for what happened, a department spokesman says the site failed, plain and simple. According to the spokesman, it had not been updated since 2013 and had suffered several intermittent outages before finally crashing on the 8th. Friday afternoon, DeVos issued a statement, saying that the site and its server "were neglected for nearly four years ... and I've instructed Department staff to begin working with stakeholders to build a new and improved site." For the time being, ED has moved the site's old files to a new server. The department spokesman said it was too early to know how long the official re-build would take. Did Betsy DeVos Make You Want To Run For School Board?